July 4 – Library closed for the holiday. July 6 – Open Craft Night, 1st and 3rd Mondays of each month, 6:30 pm -7:30 pm. Knitters and crafters who would like to meet and socialize in the library every 1st and 3rd Monday from 6:30 pm -7:30 pm are welcome. The Knitting for Beginners program will take a break this summer (June – August) and start back up again in the fall. July 7 – Tuesday Morning Family Story Time: Caribbean Blues the Rhythm of the Ocean; 10:30 am; Sign up required. July 9 – Michael Recycle – Ecology Action Center program; 10:30 am. Sign up required. Story time for 3 yr.- 6 yr. olds. The whole family is welcome! July 10 – Friday Movie Mornings; 10:30 a.m. Bring a friend and your own snack! Friday Movie Mornings will continue the rest of July, take a break in August, and then continue in September after school at 3:20 pm. July 27 – Monday Evening Book Club, One Good Dog by Susan Wilson, 4th Mondays at 6:30 pm. Would you like to start your own book club with a group of friends? We can help with book selection, and loan the books you will need for your group. Stop by today and ask for details. 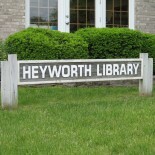 This entry was posted on July 1, 2015 by Heyworth Public Library District.